John Richards explores the idea of Dirty Electronics that focuses on shared experiences, ritual, gesture, touch and social interaction. In Dirty Electronics process and performance are inseparably bound. The ‘performance’ begins on the workbench devising instruments and is extended onto the stage through playing and exploring these instruments. The Dirty Electronics Ensemble is a large group that explore these ideas and whose members are often made-up of workshop participants. The workshop is central to the Ensemble in that all of the musicians have to build their own instrument for performance. The group has performed pieces specially written for the Ensemble by, amongst others, Japanese noise artists Merzbow, Pauline Oliveros, Howard Skempton (founder member of the Scratch Orchestra), Gabriel Prokofiev, Anna Meredith and Nicholas Bullen (ex-Napalm Death and Scorn). Other notable collaborations include working with Rolf Gehlhaar (original Stockhausen group), Chris Carter from Throbbing Gristle, Keith Rowe, Anat Ben-David (Chicks on Speed), Kei Miyata (Karas/Teshigawara) and STEIM (Amsterdam). In 2011, Dirty Electronics created a specially commissioned hand-held synth for Mute Records, and, in 2014, a follow-up release, the Mute Synth II, that included a hand-held synth and an album with artists associated with Dirty Electronics and Mute. The album features, amongst others, Chris Carter (Throbbing Gristle), Simon Fisher Turner, Dominic Butler (Factory Floor), Kidanevil and Dirty Electronics. The artwork for both Mute Synths was done in collaboration with the designer and writer, Adrian Shaughnessy. There have been a number of other significant artwork/sound circuits produced by Dirty Electronics: the Sonar 20th Anniversary Synth for the electronic music festival Sonar; collaboration with graphic designer Jack Featherstone and Artists & Engineers; and circuits inspired by the artwork of William Morris for the National Portrait Gallery, London. ASMO (Anti Social Musik Order) is the ‘circuit bending’ project of artist and musician Stu Smith. He works with self made instruments custom built from the modified circuits of electronic toys, keyboards and other discarded gadgets. His work explores the sonic landscape of ‘circuit bent’ instruments and their integration into existing modular synthesizer systems. He writes and performs with the groups Threep and The Buoys and has performed at concerts and festivals across the UK, Europe and New York. Moon-age is a multi-faceted artist and art director for print and video. Moon-age uses aesthetic innovation, performance, film and music to explore thoughts about spirituality, gender and identity. Moon-Age’s earliest video experiments acknowledge ‘play’ as a fundamental expression of humanity, and document improvisation, curiosity, novelty and an unselfconscious exploration of the phenomenal world. She is interested in voice and body improvisation as a tool to search for primal modes of being and perceiving. Currently she is working on a video art series, in collaboration with Hadas Hinkis and Tobi Jall and contemporary dancers, in which hieroglyphs are created out of characters and objects. She uses form, movement, colour and performance to create a virtual reality in which the artist becomes the philosopher’s stone. Moon-Age is also curator of ‘Chapel Perilous’ events in Berlin and London, an evening of ‘audio/ visual potpourri’, showcasing emerging multi-media/ musical talent. Hilary Jeffery has been working as a musician since the early ’90s and describes himself as a “desert trombonist” after his journey to the Sahara in 1990, accompanied by a trombone. Hilary believes that the sense of silent-space experienced during this desert journey is a central and sustaining influence for his music. As a musician he aims to share this experience, creating inner-space for listeners and fellow musicians to explore. In this proyect Martí is in the research of sincronized audiovisual experience. Synths, video mixers, and circuitbending machines are used to control the flow of electricity transforming image into sound and reverse. This proyect aproach deals with the beauty of visual noise, feedback, electricity and light. Live performance where audio produce image and image produce audio. Wojtek Bajda Grown up in Przemysl/PL, attended to music school with classical direction. Graduated in Germanny and Switzerland, [MMH/HKB/HKS]. His Classical base gave him the need for searching in the area of Noise-Conterporary Music. Nowadays he lives and works in Berlin as free experimental noise musician on his Solo Tours, and Cooperates with others Musicians. utter-st is a duo project by Martin Lau (voice and effect processing) and Marcello Lussana (live electronics) that research how human voice sounds are generated and composed. 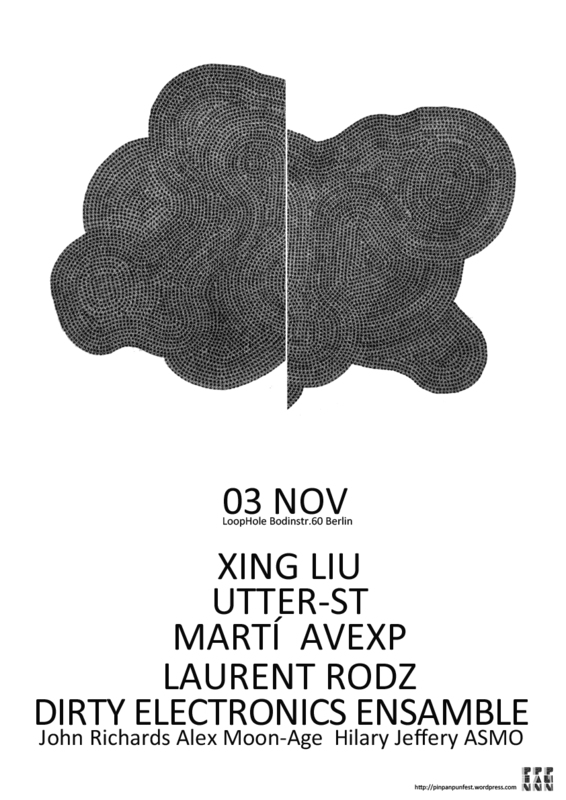 Martin Lau explores the possibilities of his own voice together with effect processing while Marcello Lussana recreates and mirrors this world with live electronics and self made software.